Update: The Supreme x Air Force 1 Mid will be made available at 21 Mercer via the Nike SNKRS Pass soon. 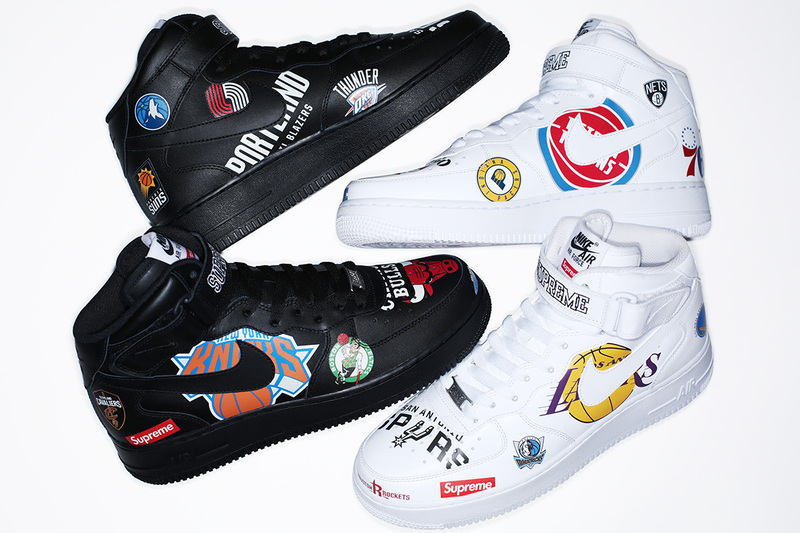 Supreme continues its exciting partnership with Nike and NBA with its most extensive footwear/apparel collection to date. With a design concept that highlights all thirty NBA teams, this assortment includes the Air Force 1 Mid, the warm-up jacket with quilted satin lining, and Authentic Jersey and Shorts with poly mesh bodies. Each of the pieces features the logos of all thirty NBA franchises all around the upper withe Supreme’s signature red box logo as well as Nike Swoosh logos. The entire Supreme x Nike x NBA collection will officially release on Thursday, March 8th online and in-store at NY, Brooklyn, LA, London, and Paris (March 10th release in Japan).